After Ralph arrived in Houston from Corpus Christi, a personal tragedy struck the family. John A. Marek, John L, Bill, and Ralph’s father, died at the age of 53 from a long illness. His wife, Hermina, was in her forties and was a very dedicated and hard worker. She kept herself busy answering the phone for her sons' company and helped with the administrative work. Everybody was on the lookout for new home slabs and then contacted the builder for the drywall work. The Marek Brothers paid their employees slightly above the standard rate and their bids for the jobs tended to be 5 to 15 percent above the competitors' rates. To justify these higher rates, they put a lot of emphasis on providing quality work and great customer service. This dedication to quality work and great customer service paid off. 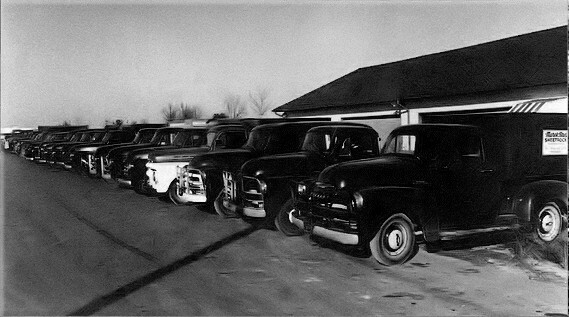 The 1950’s saw the company getting work all around Houston, and they assembled a fleet of some twenty trucks, mostly Chevy trucks and a few leftover Army Jeeps. Prior to the recession of 1957, their workforce had grown to 75 employees, earning anywhere from 87 cents to over $2.00 an hour. Fortunately, the recession was short lived and work was back to what it was before the recession started. Even though it was brief, it created high unemployment rates and caused many businesses to fail. The Korean War at the time placed a great strain on available labor and the unions began to get stronger. The Houston economy was very strong due to the demand of petroleum and chemical products and a significant amount of capital poured into real estate investments. With the job market as good as it was, unions succeeded in driving wages up 130% from the late 1930s levels. Houston’s population grew by 50% over a 10-year period to almost 600,000 inhabitants by 1950. During the 1950’s, 99,000 homes were built. While petroleum and chemical were the catalyst that drove Houston’s strong economy, other larger cities around the country benefited from the massive infusion of federal FHA and VA program funds for single-family housing. In 1952, the company made a major change in the way it handled the drywall. They usually relied on the contractor to supply the drywall for the job. However, one day Jim Towsen, a young sales representative for Bestwall Gypsum Corporation, gave them the idea of purchasing the drywall themselves. He recommended that they become a supplier of materials and labor, instead of just labor. It would mean investing in more vehicles, building additional warehouse space, and carry more inventories. Within a short time, the new venture started to pay off. During this time, the Marek Brothers enjoyed a period of expansion and started to diversify into supplying and installing insulation as well. By the mid-fifties, all three brothers had laid down their tools to concentrate on the management aspects of the business. Ralph spent his time overseeing the accounting and collections, and working with Pete Peters scheduling jobs. John L. and Bill tended towards sales, bidding the work, and servicing their accounts. On occasions, John L. would take out his tools and start working alongside a crew. Around this time, whole subdivisions of small GI homes of around 1,000 square feet were springing up around Houston and John L. would frequently bid on handling the complete subdivision, with the crew completing 2 to 3 homes a day. The goal was for a crew to complete a house in a day, if the house was a little larger, they would put on an extra worker. Quarter inch work also became part of the business during this time. This was a relatively a new procedure of installing ¼ inch drywall that was put over shiplap in older homes to make them look more modern. The walls contained ¼-inch drywall and the ceilings had 3/8-inch drywall to keep it from sagging. Remodeling work paid well, typically $100 a room for labor and materials, but required more skill than regular drywall work. In many cases, furniture was in the way and carpets had to work around it. In addition, since the trim was already in place, the drywall had to have a perfect fit against the edge of the windows and doors. Whether remodeling or doing new work, the Marek’s took pride in their work and gained the respect of many builders in the Houston and surrounding area. This respect paid off with repeat work and in other ways, as well. One day a homebuilder called and said he was not able to pay the $4,000 he owed them, but did own 40 acres of land north of Tomball in exchange for the debt. They made the exchange and gradually, Circle Lake came into being. A friend of Ralph's, Don Dean, dug the main lake, and then they built a house on the property. Soon after, all employees could enjoy the use of Circle Lake as an added benefit to their employment. Eventually, Ralph built his own weekend home there. Over the years, Ralph had additional lakes built for fishing, gardens planted, and more houses added to the property. The employees could use the houses for free. As the property expanded, there was a need for a permanent caretaker. Over the years, the property had different caretakers, and mainly the employees used the property as a recreational outlet. Boy Scout troops, senior citizens, religious groups, customers, and many others also made use of the property. With more capital in the bank than needed to run the business, the brothers starting looking for other investment opportunities. Stocks and bonds were too risky and certificates of deposits paid too low, which at the time were paying about 3-4%. Mortgages, on the other hand, were paying 6-7%, which was a good return then. At first, they had a builder, James Henry, who built the house for them, sold the house, and they carried the note at 6-7%. In a short time, they had completed their first street of homes off Blue Bell, appropriately called Wallboard Court. One day John L. was talking to the two carpenters, John Zetka and “Pop” Magar, and they indicated to him that their builder was not able to make payroll. The Marek’s agreed to hire the two men to build the homes for them. To keep the home building business separate from the drywall business, they formed Stanley Construction. For the next two years, they had the two carpenters build as many homes as they could, which was about a house a month. In most cases, they did not need to advertise the sale of the homes, a sign was sufficient to attract buyers. The post-war years were very good years with job opportunities abundant and wages were three or four times the prewar period. The good times had people go on a spending spree and caused the manufacturing companies to keep up. This created a problem of inflation and President Dwight Eisenhower introduced a number of anti-inflationary measures and in turn created a recession. For an enterprise that was accustomed to have more work than they could handle and a workforce of 75 who enjoyed many hours of overtime, things were starting to look bleak. Unwilling to lay anyone off, the company started to rotate the workforce with different people taking days off without pay each week. Some reduction was inevitable, but the company made it a policy to lay off only the young single men rather than the married men or the more senior men. It was a worrisome time for the Mareks. For months, all they could do is sit and wonder if all the hard work they had put into the company was going to be all for naught. Fortunately, the recession was short lived and by the end of 1957, the company was back at its former pace. Business was profitable and the brothers looked for additional investment opportunities. Stanley Construction continued to be mainly involved in building houses for sale with them carrying the mortgages. A track of land just west of the Marek Brothers office became available for sale, which the brothers could make a deal on. After they bought the land, they formulated a plan to build a small subdivision of duplexes and patio homes, calling it Blue Bell Village. John L. assumed much of the responsibility for Blue Bell, slowly disassociating himself from the drywall business as it continued to grow.